It’s no secret that I love Lightroom. But I haven’t always loved how slow the Lightroom Develop module could be, especially when editing the huge RAW files from my Nikon D800. The team at Adobe still has some work to do in the speed and performance area, but a recent update to Lightroom brought a fantastic new feature you can enable that has saved me so much time when editing in Lightroom. If you aren’t familiar with Lightroom Smart Previews, they are low-resolution versions of your images generated by Lightroom. The file size is less than 5% of a full-size RAW image. They were designed for working with your images when you were away from your originals, such as if your EHD was disconnected. Some users realized they could edit a lot faster from Smart Previews, and learned how to trick Lightroom into using Smart Previews when they wanted to boost performance when culling or editing to speed up their workflow. Adobe listened to users’ feedback about this aspect of Lightroom performance it seems, because the Lightroom CC 2015.7 and Lightroom 6.7 update added a feature speed up Lightroom editing by regularly working from Smart Previews. When I first learned about this feature, I wasn’t sure if I would like it, because I’m a pixel peeper and I like to zoom in to 1:1 to check for sharpness in my images. I also need to zoom in close to use the adjustment brush or clone/heal tool on fine areas, such as facial features. The great news is that Adobe allows this. When you zoom in 1:1, it first zooms 1:1 on the Smart Preview size momentarily, then loads the full-resolution image at 1:1 zoom. This allows the best of both worlds in a way that the earlier “hacks” to work from Smart Preview couldn’t – you have fast performance for speedy editing when zoomed out, but you can easily zoom in to see the finest details when you need. If you already generate Smart Previews for your images on import, all you have to do is enable this new feature. Skip to Edit Preferences for instructions. If you aren’t already creating Smart Previews, follow the instructions below to generate smart previews and then edit your Lightroom preferences to enable the feature. You can generate Smart Previews when importing new images, and you can easily tell Lightroom to generate Smart Previews on already imported images. Keep in mind these Smart Previews will take up some space on your hard drive, but a lot less than original files. However, you may not want to have Smart Previews for all of your images in you catalog, and you may eventually want to remove them for older images. To generate Smart Previews for images that you already imported into Lightroom, select a group of images in the Lightroom Library panel, then go to Library > Previews > Build Smart Previews. Follow the instructions below to enable Lightroom preference to use Smart Previews when editing. Open the Lightroom Preferences dialog by going to Edit > Preferences (PC) or Lightroom > Preferences (Mac). You may have noticed that I don’t have Use Graphics Processor checked. Some systems will see improved performance when using this feature, but other systems will actually be slower with this enabled. Older computers should keep this disabled, and even with a new system, experiment to see which way works faster for your system. 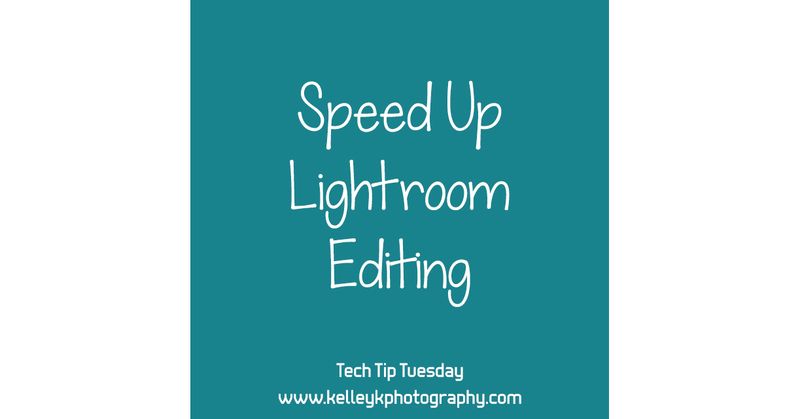 I hope this helps speed up Lightroom for you! And if you’re already using this feature, comment below and share your experience. Is your Lightroom editing workflow faster with this enabled? It sure is for me!